I am unable to find more DMC files. and I am not sure if they can be made.by me. I read the pdf and yes you can create a NLA for a audio file but without a DMC don't you have to build each file to the audio ? any info is good info! With Mimic for Carrara, you can create your own NLA poses for the facial / vocal expressions and associate those with Vocal sounds, so that mimic analyses the sound and creates the lipsync according to how you set up the NLA poses to the sounds. You'd normally only need to create the NLA poses once for your character, and then save the file,. and the NLA clips/poses will be saved with it,... the NLA poses can also be saved separately to your clips folder in the browser (or a folder for that character),. No way! That's too freakin' cool! Thanks 3dage! So, if I'm reading this right, it's an NLA Master Pose that you save, or a clip - which is it? Then you only save info for the head? Where did you come to learn this? yes,. you save an NLA Pose,. for each vocal shape, like OOh,. Ch, Aah, etc..
then get mimic to analyse the sound, and it adds your NLA poses to the time-line to make the lip-sync. As with any automated processes, there will be some refinement and adjustment needed to get things right. but it's a Big, time-saver. After creating voice expressions, is there a way of saving them as DMC files? I have Mimic Pro, which appears to save DMC files, but for the live of me I can figure out how to use it. I believe that the Mimic Pro (stand alone version) pdf manual has good instructions on how this is done - If I remember correctly, you use Mimic to go through each sound and expression and set it up in there. When you've finished (at least for the day), you can export or save the DMC file from the Mimic menu. It's been forever since I've read it. I downloaded the manual years ago to see what you do with it. Impressive software, that! 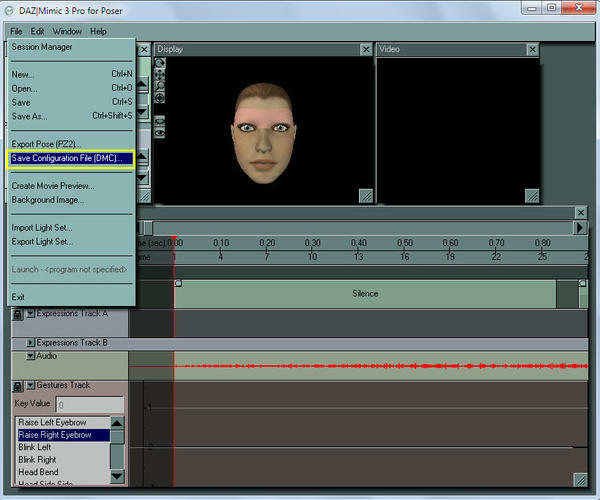 This allows you to add or change the morphs used in the Phonemes and visemes to suit your customised Daz3D figure. In Mimic for Carrara,. once you set up the poses to be used for vocal sounds, your Carrara Character and it's Mimic settings can be saved as a Scene or as an Object (animated group) and will load with all the mimic settings and NLA poses. thanks 3Dage and every body else I found it easier to make the DMC on mimic and use it in carrara! anyone want a DMC file for Sledge? from Sixus1 ? when I approached seriously carrara since 2008, I intended to use it for professional animation because I had understood the potential, well after three years I am more than ever convinced that I am right: the only reason holding me back is the facial animation of daz characters plus mimic as well that are far from being usable (hope I'm wrong): everything that is still to be improved in carrara does not scare me, not the bags nor weight maps or hair or dinamic clothes or some animation lacks or anything like that, but the facial animation is an obstacle too difficult to overcome because it inheres a part of the reality we know too well, the human face and its expressions. my hope for daz and carrara is to seriously address this issue because it is essential for those who want to use them professionally. you can create morphs in carrara save the file open it in mimic pro ajust the morphs to the Phonems ( happy new year Im smashed) and the n apply the DMC file to the charitor in carrara trust me it works! don't be pesomistic!! I'm not under the infuence of alchol as some thikle peep i am!! 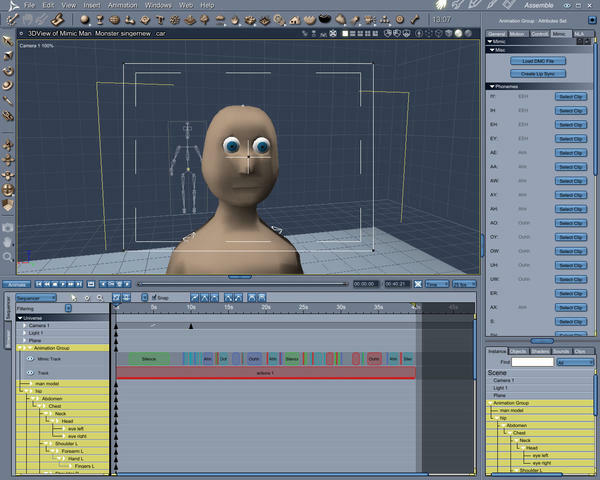 I was astonished that a saved Poser talk designer (animation) file actually renders in Carrara with proper lip sync. Wish I thought of testing this earlier... So if you don't own Mimic for Carrara or have the DMC file for characters like Miki and company, here is another workaround. I am working on the Idea that if you create the morph in another program and save the modified cr2 that mimic pro will let you animate it. It's rather shocking that Disney made any animations at all without microdisplacement and relaistic fibrosity under the skin tissue... What could they have been thinking? Try putting an ADD operator in the bump channel and combining your bump and micro-displacement maps there. If you turn up your overall bumpstrength, you can turn down the brightness of your regular bumpmap. It may take a bit of tweaking, but you should be able to find satisfying settings without too much effort.